How cheap is The Time Bum? So cheap, I will wait all year to buy a suit so I can get it on sale with a free pair of pants. So cheap, I have developed advanced squeezing techniques to get the last bit of toothpaste out of the tube. So cheap, I can compile a list of watches worth owning that are all under $50. You heard that right: five watches, worth owning, under fifty. HMT Pilot - As I mentioned in my HMT overview, these watches are like little time machines set to 1960. 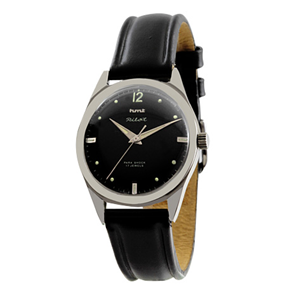 They have mid-century designs, acrylic crystals, hand wound in-house movements, and have been assembled by hand in the same aging factory in Bangalore, India for over 50 years. The Time Bum loves an anachronism, but loves a cheap anachronism even more. Besides, how many times have you been sitting in a meeting, looked at the wrist of the guy across the table, and noticed his Indian made watch? I'm guessing "never," and for that I am awarding it bonus style points. You can get the Pilot and a variety of other HMT models from HMT Watches Online or The India Store for $30-45 depending on the model. 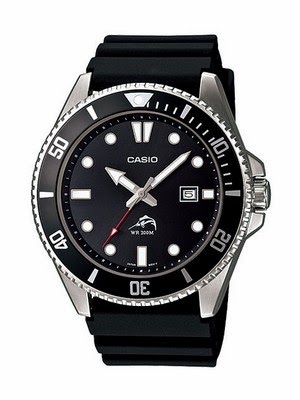 Casio MDV106-1A Duro200 - You knew there had to be a Casio on this list, but some of you may wonder how could I assemble a collection of cheapies and not mention everyone's favorite plastic digital, the $10 F91W? Because I pledged to tell you about watches worth owning. A hideous plastic digital is not worth owning. * I may be cheap, but I am still a snob. Instead, I suggest you dig a little deeper in your pocket and shell out for one of these. It lists for $69 but The Casio Store on Amazon has it for a mere $37.92. This will get you a proper three hander in a stainless steel case with a robust quartz movement, unidirectional dive bezel, and 200m water resistance, which is frankly astonishing for this price. * If you really want to know more about the F91W, check out this four-part series at Worn & Wound. Great set of articles, but I still don't want one. Swatch Original Gent - Swatch changed the game when it introduced its cheap, colorful, Swiss made fashion icon in 1983. The Original Gent's model is 34mm, with 30m water resistance, and still available in just about any style or pattern you can imagine. 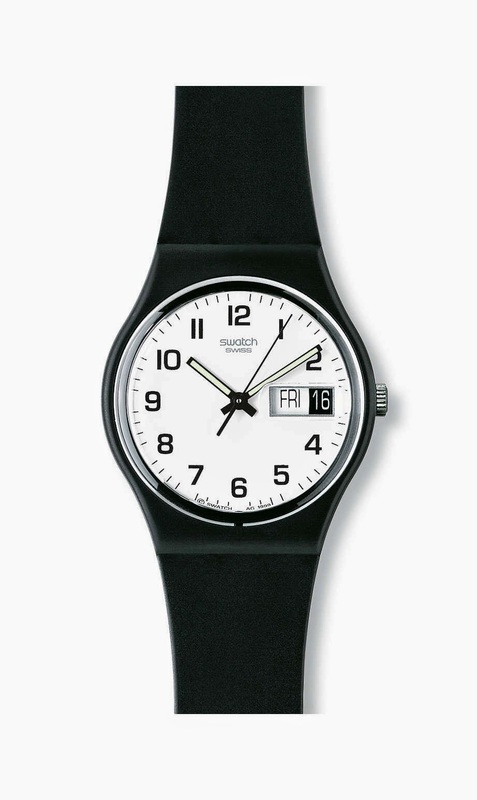 The Swatch Online Store offers several flavors of old school goodness starting at $50, including this black-on-white Once Again. I bought one similar to this in '84 or '85 and wore it for years. You can change the battery with a dime, and the strap with a paper clip. When I put one on, I hear the Psychedelic Furs in my head, and that is good. 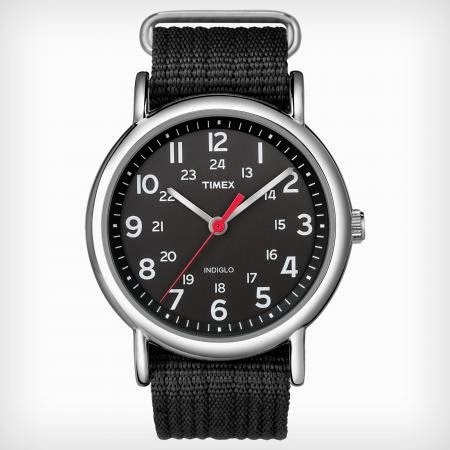 Timex Weekender - Everyone knows the Timex Weekender. Legions of Etsy strap makers have built a cottage industry around it. It is both average Joe and urban hipster. It takes a lickin' and keeps on tickin'. It is cheap and cheerful, but better still, nobody pays the full $45 list price for a Weekender. This is probably one of the most discounted watches on the planet. You can find them for sale all over the Internet, including the Timex site. The trick is to get one for as little as humanly possible. I found mine on the flash sale site, Beyond The Rack, where it had been dropped to $25. That's not a bad price, but even better when you have a $20 referral credit. So I got a $5 watch. Granted, it has no real water resistance and the loudest tick imaginable, but it looks cool, will probably last forever out of pure spite, and it cost me five frickin' bucks! Vostok Komandirskie - If you like the Vostok Amphibia, don't care about water resistance, and can't bear its outlandish over $50 price tag, then the Komandirskie might be the watch for you. Unlike its deep diving sibling, the Komandirskie has only nominal (30m) water resistance, and is housed in a plated brass case. On the other hand, it is similar in both size and style to the Amphibia, has the same robust automatic movement, and is available in wide range of case and dial options. 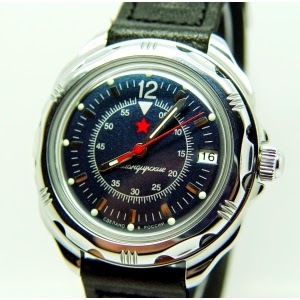 You can get one brand new for less than $30 from Russian watch retailers like ChistopolCity.com.